The sliding doors we see today are much different from the ones of years past. Stronger locks and frames and heat reflective glass make a modern sliding door both thermally efficient and a source of security and safety. Modern sliding doors can be built from Vinyl or from Wood in most cases but there are composite frames also out there. I think they are a bit cost prohibitive but they are an option. We offer sliding doors from NT Window, Alside, Burris and Associates, Don Young Company and Atrium Window and Door. All have some great features and our recommendation is usually related to what window would be best in the home over the long run. We look at the home value, your estimated time to live in the home and what the neighborhood itself is doing. Sliding doors will have Low E Glass with Argon from Cardinal, PPG or from Guardian and will offer Energy Star Approval with great performance and a streamlined modern look. All of the ones we sell are great, they just have different applications based on the variables that you and your home bring to the table. One of the main reasons we offer 10 different manufacturers is to bring what's best for the home and the application. It's what makes our approach better. A few of our manufacturers offer wood grained interiors on their quality vinyl slidng doors. Some have custom exterior colors available as well. All will have a great glass package and offer amazing thermal performance for those hot Texas Summer days. This approach leaves you with a wood look in a zero maintenance frame as opposed to wood doors that will have that great look but will need upkeep and ongoing care. With the real wood doors, they can get ruined with hand oils and other stains that might be typical in normal use. Vinyl is more durable for sure, but wood is a one of a kind look. The wood ones are considerably more expensive than the vinyl in all cases. Most vinyl sliding doors will have a lifetime warranty whereas wood doors are usually about a 10 year warrranty type item. This has been one of our favorites for many years. The Alside Company makes a few different models but the top of the line one is our real go to product. The top picture shows a cutaway of the frame and it's more than impressive. It's made of treated wood with a vinyl clad covering and aluminum tracks. It's more than 5 inches thick and has a lifetime warranty. I think these doors will be sliding along in 50 years personally. Beige and White are the standard colors but they can have a laminated cover to achieve any one of a number of color schemes. You can find out more about custom exterior colors for sliding doors and windows to match at the following link. The real plus side to sliding doors as opposed to swinging doors is the space it saves. A sliding door allows space in front of the dead panel in a way that a swinging door just can't. The added space is a real plus. Most of the time when I hear of someone wanting to replace a slider with a swinging door it has more to do with their perception of the old time sliding doors than real understanding of how awesome the new ones are. I many folks prefer the additional light from more glass you'll see with a sliding door. Sliding Doors have about 30% more glass than do even full glass style swinging doors. More light and better usage of space are both great reasons to find a good sliding door with the modern glass packages and be truly amazed at the performance. Sliding Doors and the Adjacent Window we see in a Fox and Jacobs home. Fox and Jacobs, later known as Centex, built literally thousands and perhaps tens of thousands of homes in the North Texas area from Garland to The Colony, from Duncanville to Mesquite, Flower Mound, Lewisville and beyond all have sprawling communities with this exact window and sliding door configuration. They were all terrible when they were built and time hasn't made them any better. I replace a lot of these. I would guess I've fixed this set up a few hundred times. The main conversion is to change out the gold aluminum post for something more presentable, usually a clear select pine works well. These are also often short doors coming in at 78 1/2' tall instead of the typical 80" tall. I don't know who saved 37 cents by installing ten thousand really short doors, but the homeowners are surely dreading it now. They do require a custom door or a header cut to work out correctly and the window has a lot to do with the installation as well. All of these doors have lifetime warranties, sliding screens, low e glass with argon gas and some amazing performance. Jeldwen, Pella, Marvin, and Andersen all make this product and it's a mainstay of the sliding door world. The Aluminum Clad Wood Sliding Door has been around for decades and is the product used most often in higher end homes. Wood sliding doors are usally pine inside but you do occasionally see more exotic woods being used. The outside being aluminum clad means there is nothing to paint and it's impervious to the elements. This door really should last for 50 years. Any of the doors you see here can be with grids or without. Some manufacturers use flat grids and other use contoured grids. If you want grids, make sure you get the right ones. wood, sliding, doors, door, grids, Jeldwen, Marvin, Pella, AndersenContact us! You can see them at the box stores but those aren't really going to provide the longevity we hope for in a good sliding door. The real ones have many of the same features but are just built better. For more than 3 years we were the primary window and door installation contractor for Lowe's and Home Depot. We did installs for 24 stores in all and we saw it all. With both providers it seemed like the doors would be fine for the first year or two but would have problems shortly thereafter. As a contractor it became a service problem on a fairly regular basis. Now that we get to pick the suppliers we use, we make sure to get ones who sell products without issues and service problems. In some ways this was for you the customer, but it was for us as well. No one wants to have a service issue and the best warranty out there... is one you never have to go look for because the product always works correctly. That's the warranty and the sliding door we want you to have. We really do have about 4 or so that we sell a great deal of. I think they are all good and have their place in the market. The only challenge is to get the right one to you! Let us help that happen. vinyl, sliding, doors, pvc, nt window, alside, don young company, burris and associates, atrium Contact Us! I really like this manufacturer. 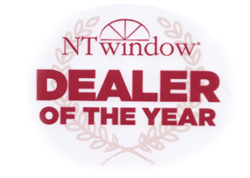 I was the NT Window Energy Master Dealer of the Year three of the last four years, mostly because I just believe in their product so it was easy to sell. They have a huge plant just south of Fort Worth which keeps shipping cost and breakage to a minimum and keeps them at a great value point. Their sliding door is comparable to a Simonton and several hundred dollars less in cost. They use Cardinal 366 Low E Glass with Argon Gas filled insulated glass direct from the Cardinal plant in Waco. They have a very streamlined operation designed to take great care of us in the South as a whole, but really well positioned for the Dallas Fort Worth Metroplex. NT Window, Sliding, door, doors, screen, local, Dallas, Fort Worth, manufacturer, windows, award, winning Contact Us!